Welcome to the style blog for Encore Boutique in Atlanta, GA! This blog combines style tips, our love for fashion and information about our newest merchandise all into one forum where we can communicate with other fashionistas. Thanks for stopping by and don't forget to follow us! If it hasn’t been clear the last few weeks, there’s certainly no question now that winter is officially here. That means it’s time to pull out your best outerwear and winter accessories. What’s hot this season in outerwear trends are subtle updates to classic styles and there’s no time like the present to go out and treat yourself or a friend to a great Holiday coat find. 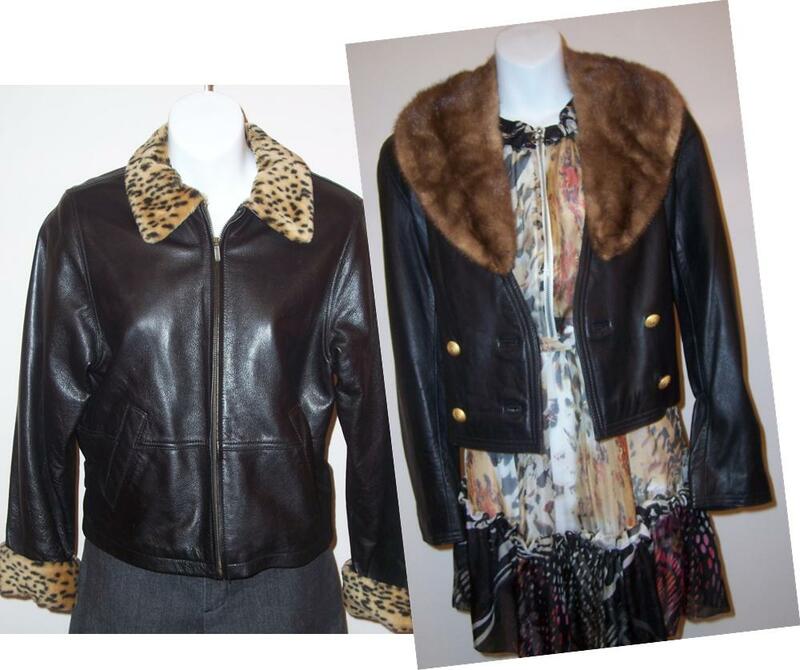 Just about every designer winter collection features a cute cropped leather jacket ranging in styles from military inspired to biker chic and delicate/feminine. For a new spin on your leather jacket, try styling it with a soft and ruffled dress. The contrasting soft and hard textures, coupled with a pair of tights and ankle booties is sure to make a fashionable statement this winter. Quilted and printed coats are great because they can easily upgrade your look. Their rich textures and eye-catching designs add an element of sophistication to your ensemble. What’s best about them, in my opinion, is that the chance of someone else having your same coat is highly unlikely. When wearing quilted or printed coats, keep in mind that less is more. The rest of your outfit doesn’t have to be a print; it should be simple yet stylish. Remember the coat is the head-turner, it needs no help. The greatest thing that could have ever happened to fur was the creation of faux fur. It was a much needed compromise, keeping existing fur connoisseurs happy and creating a peaceful and politically correct alternative for die-hard animal rights lovers who happen to love fashion. 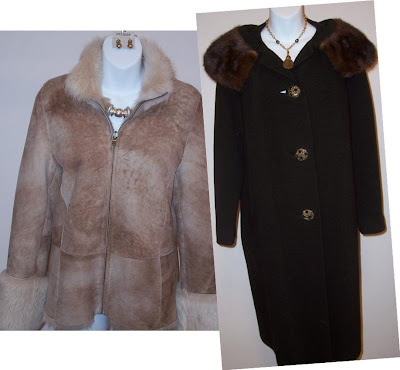 Fur is making cameo appearances on just about everything fashionable and has the ability to make a coat look fabulous and keep you warm at the same time. If you were ever thinking about adding a real or faux fur coat to your collection, this is undoubtedly the time to do so. 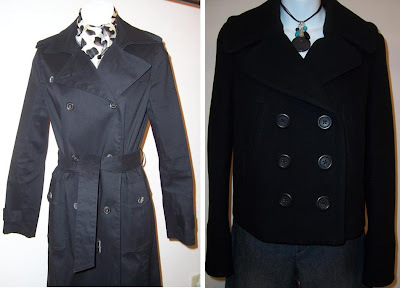 What’s great about winter outerwear is that there are always going to be coat styles that remain fashionable year after year like trench and pea coats. These are your staple/investment pieces. They come in a number of colors; however, my personal favorites are solid black or charcoal grey. You can style them with printed scarves or wear accented jewels to make your look dressy or casual. With the emergence of December and Old Man Winter also comes holiday ski trips and winter hiking excursions. Even though both activities require physical contact, there’s no reason you can’t look cute while hitting the slopes and trails. 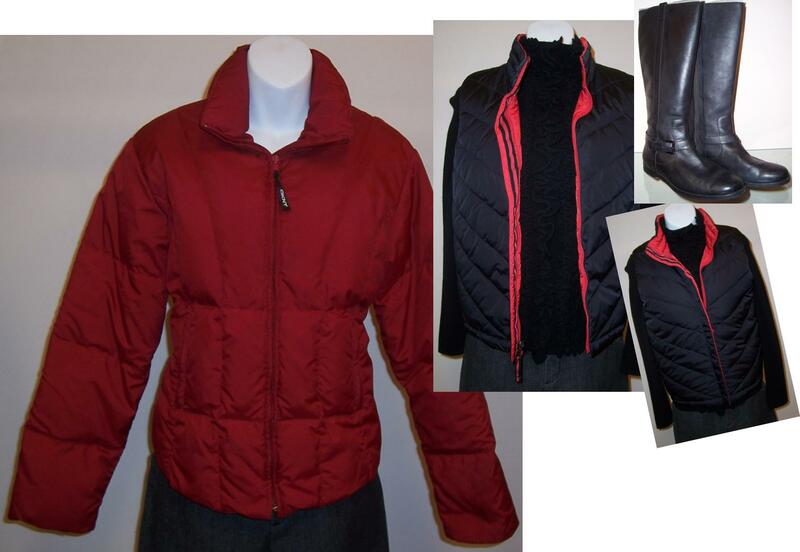 Ski parkas and vests go great with a pair of knee high leather boots and a stylish scarf and glove set. What’s best about this look is that it’s also perfect for grabbing a quick cup of coffee or strolling along shopping at a strip mall. Whether you’re hitting the slopes or casually running errands around your home town, you’ll be as cute as a ski bunny. By now you probably realize leggings and their stretchy denim partner, jeggings, are here to stay. Many have fought the trend the past couple of seasons with much gusto, but it’s apparent they are not going away any time soon. Designers have been incorporating some form of leggings into their collections and stylists have been illustrating different ways to wear them, so much so, that some of the most devout skeptics have been converted into believers. What many have discovered is that they are quite comfortable, and when styled correctly can actually create great looks. So, those of us here at Encore Boutique thought we would highlight a few of our favorite pieces in stock we’re sure will look fantastic with a pair of leggings. *Style with a pair of leggings, a belt and ankle boots or heels. Enhance this look with a jeweled collar or chunky necklace. *Style your sweater with a pair of jeggings/leggings and knee boots or pumps. To boost your look, couple with an oversized bag and scarf. *To spice up your tank and jacket/blazer, opt for the wet look or decorative leggings with rhinestones/jewels down the seam or sides. Complete the look with a clutch, oversized cocktail ring and heels. (ATLANTA) – November 1, 2010 – Encore Boutique will host their first artisan showcase, A Celebration of Women in the Arts, on November 14, 2010, at their Sandy Springs location. This unique showcase will feature phenomenal women who have exceptional artistic talent in the areas of photography, journalism, jewelry design and painting. From 1 pm to 5 pm, guests will have the opportunity to view beautiful artworks, enjoy wine and cheese and support these truly extraordinary women. There will also be book signings, a live paint demonstration, a special artisan jewelry presentation and much more. The five featured artists will be author and photographer Carolyn Burkholder; author, Carmen Butcher; artist and jewelry artisan, Kathy Estes; artist, Linda Griffith; and jewelry artisan, Susan Woodbridge. To RSVP for this free event, visit http://encoreboutiquearts.eventbrite.com/ or for more information, please contact Encore Boutique at 770.446.5040. Encore Boutique is an upscale consignment boutique with a unique twist on consignment shopping. Nearly 50% of the store’s fabulous merchandise is new, boutique-label items from over a dozen boutiques in the Southeast, New York, and Chicago. Encore Boutique carries top designer labels like Diane von Furstenberg , Catherine Malandrino, St. John, Chanel, Tory Burch and much more. 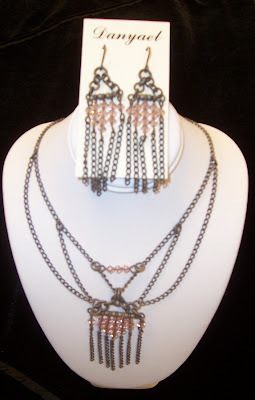 Stop by the Sandy Springs location or visit www.encoreboutique.net today! Several weeks ago, I mentioned that accessories are an outfit’s equivalent to “icing on a cake,” because they have the ability to enhance your outfit and make you stand out. Purses, shoes, scarves, gloves and hats all add a little something extra to your look. Jewelry, however, has the ability to do this as well as assist in creating a unique aesthetic that tells a story about who you are. For example, women who are up on the latest fashion trends and have a very outgoing personality are generally prone to push the envelope a bit when it comes to jewelry. They will wear the bigger, gaudy bobbles and are not afraid to have on “too much” jewelry. On the other hand, women who are conservative and are a bit more practical will more than likely wear one statement piece of jewelry rather than several flashy pieces. 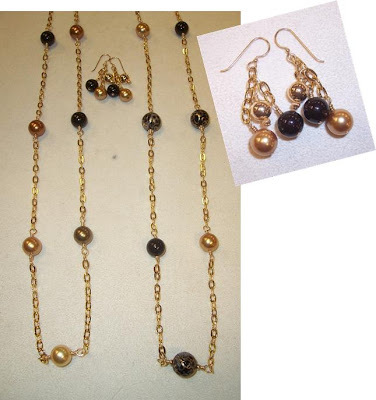 These truly beautiful necklaces and earrings are so distinct, they can be worn with jeans or with an evening dress. You are sure to be the only one wearing one of these beautifully crafted pieces. These beautiful necklaces and matching earrings are one of many designs by local Atlanta jewelry artisan, Susan Woodbridge. Note: Come to our reception and artisan showcase on Sunday November 14, 2010, view our collection of Susan Woodbridge jewelry and meet the artisan jeweler in person. Danyael Jewelry has a modern take on vintage, bohemian style. The designer, Milka Miller, has a innate gift for creating one-of-a-kind pieces for any occiasion. Stop by Encore Boutique to view designs by Danyael Jewelry and other great artisans. Whether you fall under the trendsetter, flashy jewelry personality or the conservative, statement piece personality, Encore Boutique is sure to have the perfect set of jewels for you. One of the things I look forward to the most in the colder months is being able to wear suits. There’s something about putting on a new suit with stockings and either sky-high heels or killer boots that ups the “sophistication” factor for me. Recently, I looked in my wardrobe and took inventory of all of my suits, and I realized some have been there close to a decade. They are classic pieces that can be matched with a number of different blouses and accessories and have been impeccably tailored. 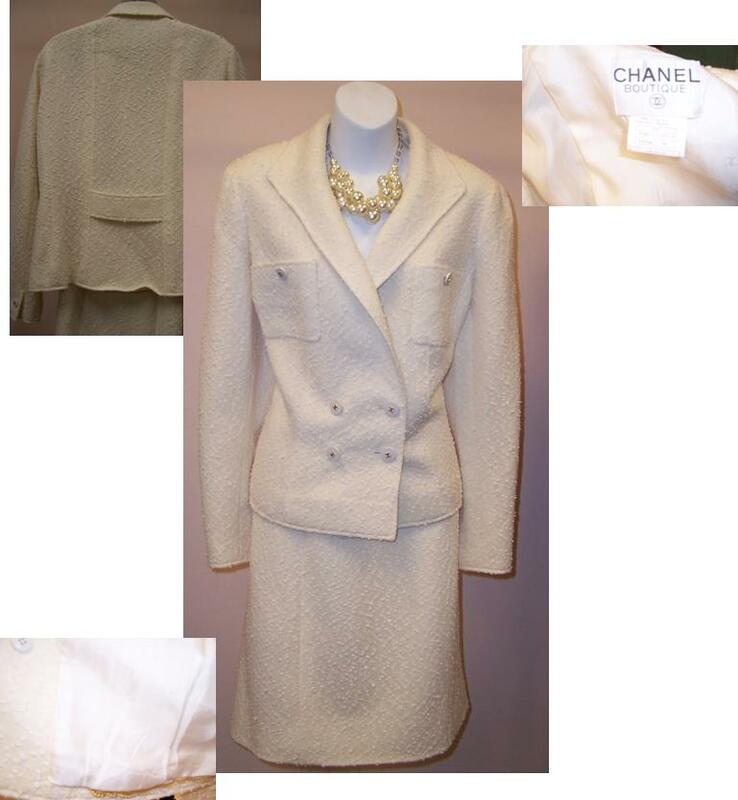 This Chanel suit has been made with immaculate fabric that provides a bit of texture. It's lining carries the label's signature chain along the hem and comes complete with button closures carrying the interlocking C's the label is known for. This Chanel two-piece knit set has a very relaxed and feminine structure. 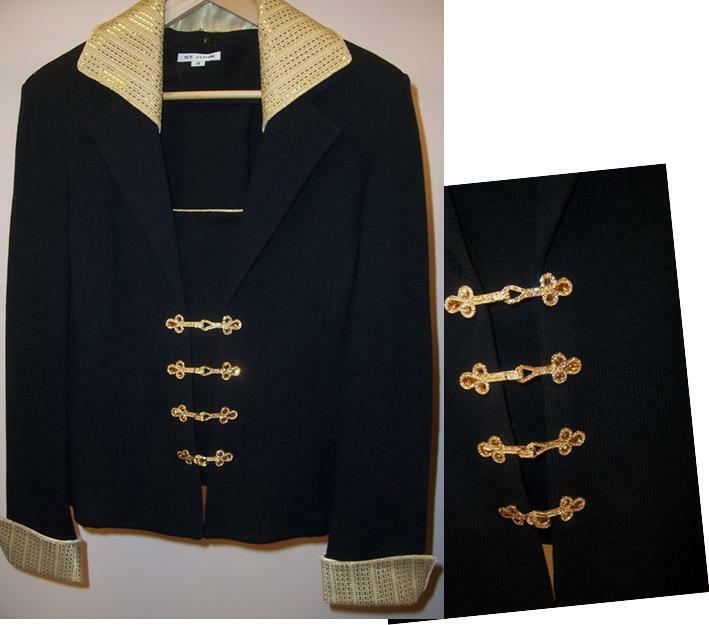 It comes with pockets on the cardigan and has a clear button closure at the nape of the neck carrying gold interlocking C's. 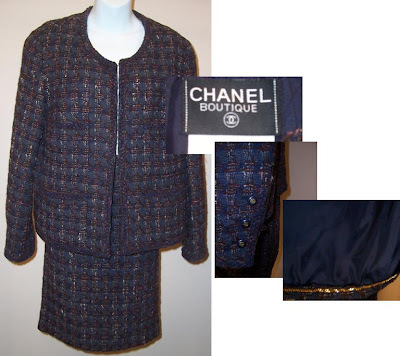 This beautiful Chanel suit is truly unique, with it's intricate fabric weaving and quilted feel. It noticeably has no button closures along the front breast of the suit jacket, and comes complete with the inside chained hem. St. John is known for their unparalleled ability to create glamorous knit garments using Swiss-made knitting machines and twisting and dying the yarn in-house in their paint lab. 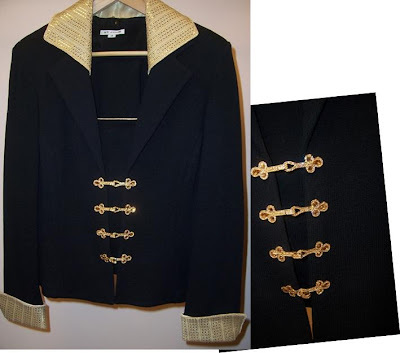 The beautiful St. John jacket pictured above has gold and jeweled frog closures and is embellished with gold sequin on the lapel and cuffs. This black knit St. John beauty is truly a unique find. 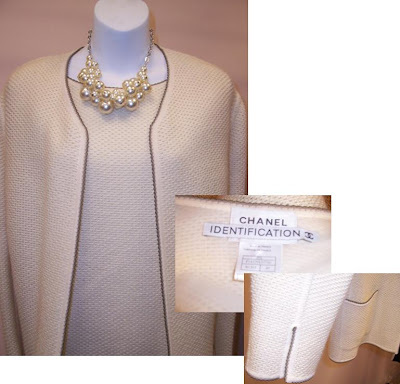 It's actually a two piece set where the jacket and sweetheart-shaped vest are attached. 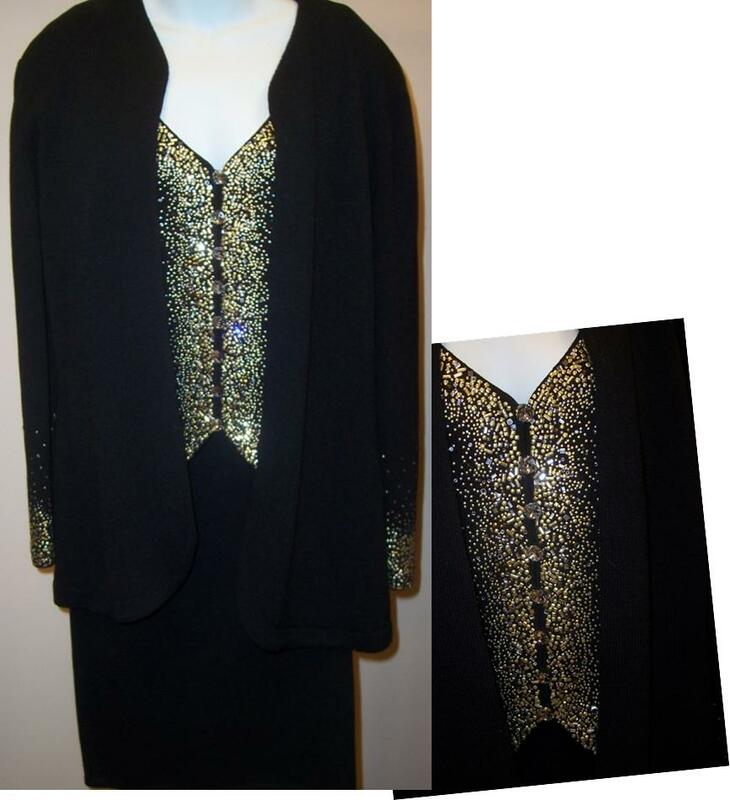 The cuffs of the sleeves and vest are adorned with matching sequin detail. 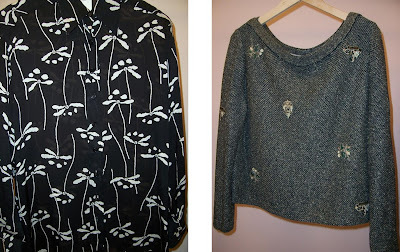 These black and white St. John knit garments are both distinct in their own way. 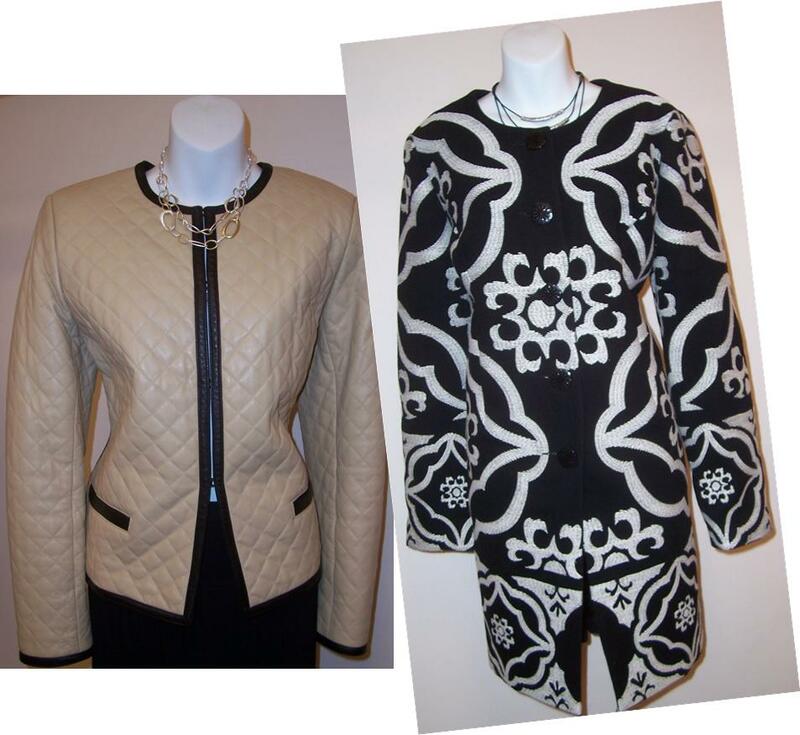 The sheath dress (pictured left) is perfect for the fall and is begging to be styled with a pair of knee-high boots. The suit (pictured right) has beautiful fringe detail along the sleeve and pockets and has stunning jeweled button closures. 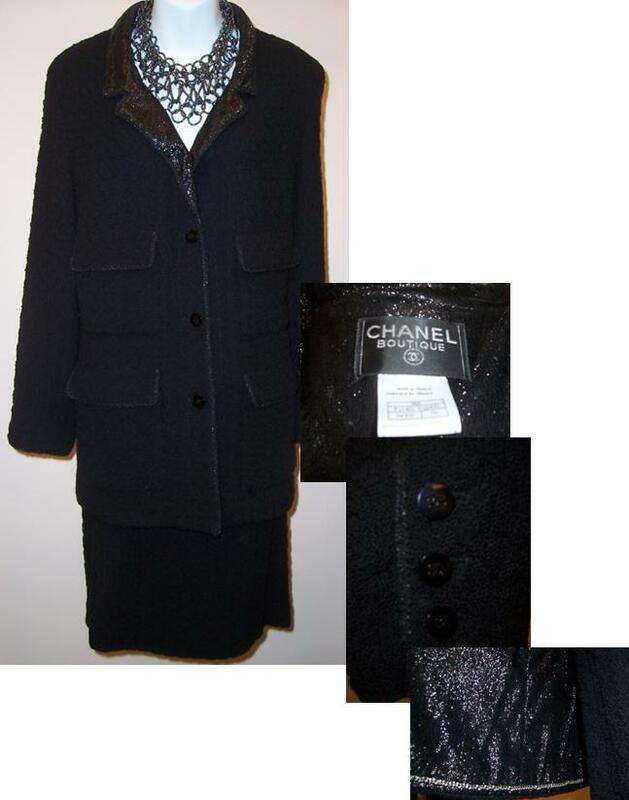 Check out these bonus Chanel and St. John finds, perfect for fall. 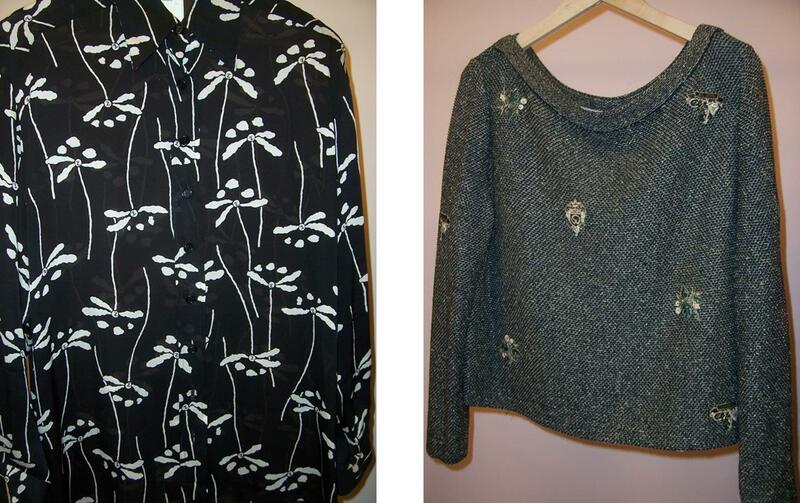 Black and White floral Chanel blouse and olive green and gold St. John sweater. Come to Encore Boutique and check out our designer section full of designer names you love like Diane von Furstenberg - Catherine Malandrino - Trina Turk - Chanel - Nicole Miller - Rebecca Taylor - Chaiken - St. John – Burberry - Escada - Armani - Misook - Marc Jacobs - Vivienne Tam, and many more. We are an upscale consignment boutique, offering better-label and designer consigned items, to include clothing, shoes & handbags. 50% of our merchandise comes directly from a dozen boutiques, providing us with new boutique-label items at our fabulous prices. We also feature the jewelry of various local artisan jewelers, along with an amazing array of fashion jewelry to complete your new look! Copyright (C) Encore Boutique Atlanta, Susan-Jacob Meadows. Simple theme. Powered by Blogger.